You have three methods to edit data. In any time, you can click Update Preview button in tool bar to preview chart. 1. 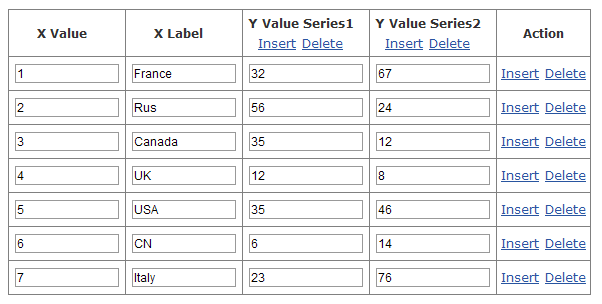 Edit data in the data table by modiftying, inserting, deleting coloumns or rows. 2. Click Quick Edit Data button in tool bar to show a edit box, you can edit data freely by modiftying, inserting, deleting coloumns or rows, after click Update button to update data in data table. Notice you should remain the format of data such as comma or quotation marks.